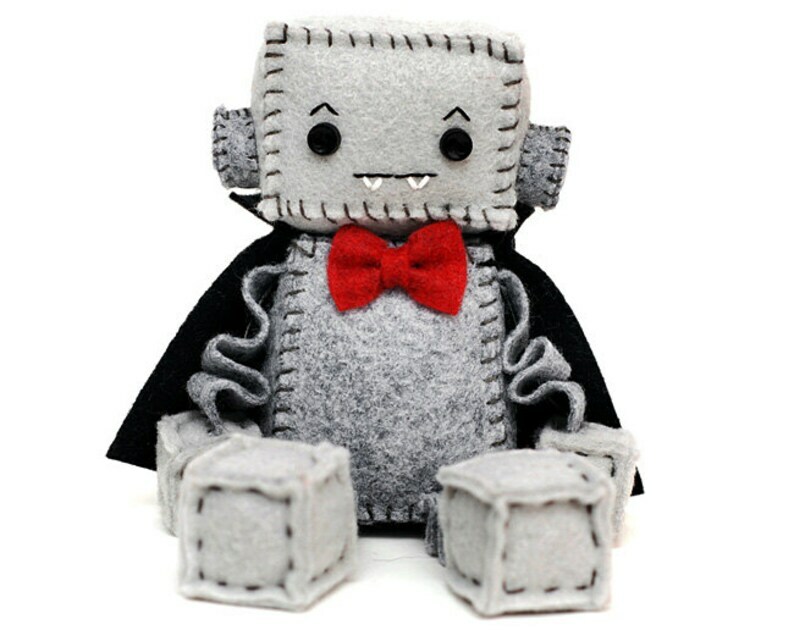 This little vampire robot has Dracula fangs, a red bow tie and a high collared black cape. He is all ready for Halloween. Robot is about 4 inches tall sitting. It is made of premium wool felt, cotton embroidery floss and little plastic button eyes. The fangs are embroidered. Arms and legs are not poseable. Robot sits by itself but does not stand. Adorable and amazing as usual! I'm pretty sure I'll be back a third time! I wish I could leave more than 5 stars. I had reached out about a veil and top hat for my window cling porgs for my pending Nerd Wedding - a completely ridiculous ask - and I could not be more pleased with the quality, correspondence or the speed.